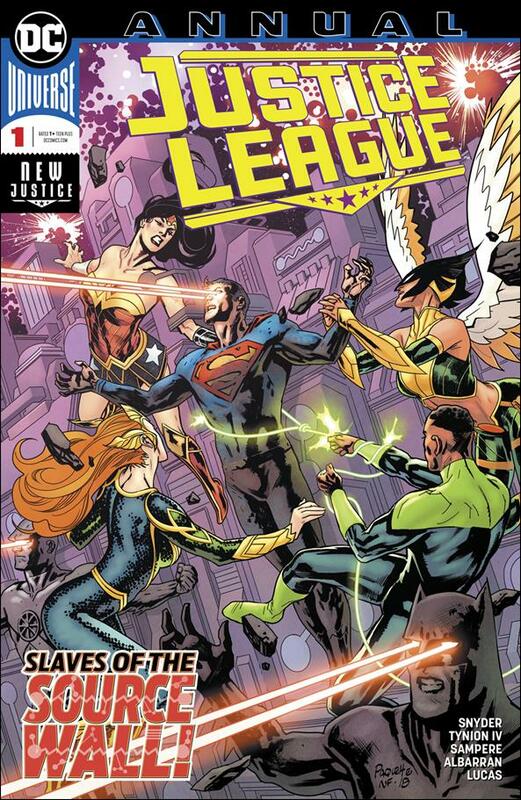 With Thanagar back on the right side of things and the Green Lantern Corps ready to help the Justice League out, it’s time to fix the Multiverse. More specifically, it’s time to fix the Source Wall, and Hawkgirl is the key. As the League sets out towards the broken Source Wall, they pass through empty space in the Javelin ship. As they get closer, they see chunks of the Source Wall floating through space. A large group of Green Lanterns can be seen holding the wall together in the distance, and as the dialogue reveals, “For months, a contingent of the Green Lantern Corps has desperately tried to hold the wall together with sheer will…Because there is a part deep down in every living being, that understands that should the Source Wall truly fall…The universe would fall with it.” Once arriving at the Source Wall, the League splits up into different stations, with Hawkgirl dawning a specialized armor and Starman opening a portal in space. When he opens this portal, the New Gods of New Genesis comes through with one of the three remaining Omega Titans (from the No Justice arc). Starman then opens a second portal, and from that opening comes more of the Green Lantern Corps with a second Omega Titan that they had managed to restrain. Starman then opens a third and final portal, which is used by Shayera and the last fleet of Thanagar to bring the third Omega Titan to the Source Wall. At the same time, Hawkgirl’s wings begin to glow and emit crackles of energy. We then go back in time two weeks to a meeting between Hawkgirl and Starman in the Hall of Justice chapel. He tells her that his connection to the Totality has given him insight as to how to fix the Source Wall. According to him, the Omega Titans were the first line of defense for the Multiverse. Once they were awoken by the breaking of the Source Wall, they were meant to absorb the energy of ripe planets and use that energy to seal the Source Wall with their own bodies. However, with one the Titans having been killed, they would need a substitute. This substitute would have to be Hawkgirl, whose wings can channel enough energy to seal the wall. Unfortunately, this would mean that Hawkgirl is trapped as part of the Source Wall for eternity. Back in the current day, Hawkgirl has put on a specialized suit designed to channel the energy needed. As Hawkgirl nears the Source Wall, Martian Manhunter calls to her through a psychic link imploring her to try another way, but she won’t be swayed. When she refuses to stop, J’onn pulls her into a psychic construct world in her mind. J’onn tells her that he has been building this for her for weeks, trying to prepare it for this moment. He plans to put Kendra’s subconscious in this dream-world once she is part of the Source Wall, allowing her to live in her own personal paradise for eternity. She then kisses Manhunter, but their psychic connection is interrupted. As Superman proclaims, “He’s supposed to be dead…He died in my arms”, Brainiac’s ship and army speed towards the heroes. The Justice League lost. Not only did they lose, but their defeat ensures the near-certain end of the Multiverse. I’m sure they will find a way to pull existence back from the edge of annihilation, but it’s not going to be an easy task. Not only does the Legion of Doom have a new member in Brainiac, but they literally have the power to end the multiverse in their possession. As if that wasn’t bad enough, it seems that the rest of the universe is turning on the heroes of Earth. However, I think that the Lanterns and the Thanagarians will have to put all of their problems with Earth aside, because it’s going to take everyone to save the Multiverse this time. Unless, the Justice League can pull off a major miracle, this is the end.